Only a few spots are left on teams. 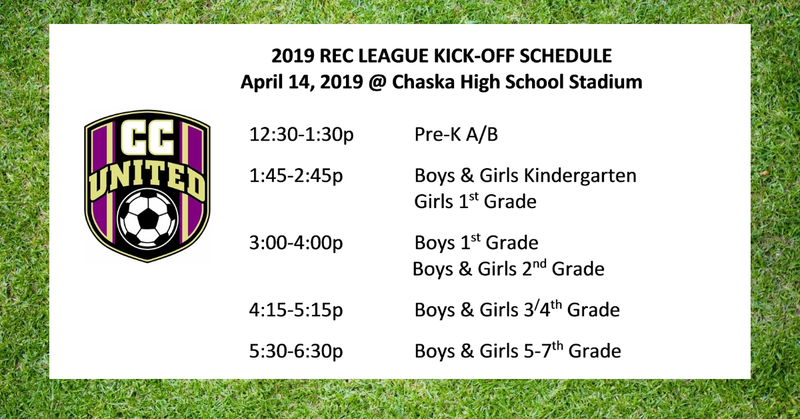 The CC United Recreational League is for players preschool through 7th grade looking for a soccer experience that emphasizes participation and fun (Players must be 4 years old by August 1). Our program offers youth players the opportunity to learn the skills, techniques and rules of soccer in a fun and healthy environment. CC United relies on volunteer parent coaches for all of our recreational teams. Please consider volutneering to coach your child' team - you can sign up in the registration. No expereience is needed! What is the season like? The season begins mid-April with a Kick-off event and ends in June with a Jamboree. Each team practices once a week on a weeknight with games played on Saturdays. There will be one practice a week beginning the week of April 15th. A team coach will notify each player regarding practice time and field. All practices will be outside, dress players appropriately for the weather. Games are played on Saturdays starting in mid-April and ending mid- June with our Summer Rec Jamboree. (No games will be played Memorial Day weekend). Rosters and schedules will be made available approximately two weeks before the season begins. Rec Games are played in all weather with the exception of lightening, hail, tornado or poor field conditions. Cancelations will be communicated via Twitter. Early Bird Discount: Completed registrations received on or before Feb. 15 receive a $30 early-bird discount. A registration must be paid in full before it is complete. What is included in my Rec Fee? Weekly practices beginning mid-April, weekly games on Saturdays, referees for older ages, Jamboree, Uniform, MYSA Player Registration Fee and MYSA Supplemental Insurance. There are no refunds after the first session of the season. All refunds are submit to a $20 processing fee. Fees will not be prorated or refunded if games or practices are canceled due to weather or field conditions. Shin guards are REQUIRED for ALL players. Shin guards MUST be completely covered by long socks. Tennis shoes or soccer shoes may be worn. All players are encouraged to bring a ball to practice and games. Team jerseys will be provided by the club and are included in the registration fee. ALL JEWELRY/EARRINGS MUST BE REMOVED! Team pictures will be scheduled around each team's game or practice schedule. You will have the option to order pictures directly through the photographer. Coaches will hand out team picture information, including schedule and order forms. Registration is based on the grade your child is enrolled in for current school year. CC United will field teams for Pre-K through Grade 7. Players must be 4 years old by August. 1. Pre-Kindergarten teams are co-ed, but all other grades will be gender specific. Team formation will not be based on school/neighborhoods to encourage interaction across our entire soccer community. CC United will try to accommodate ONE friend request. Requests must be reciprocal and the same practice night preference must be selected by both players. Coaches - will receive training from the CC United Director of Coaching and are required to complete a background check, state required online concussion training and federalll required online SafeSport Training. Team Managers - will be responsible for assisting coaches with communication, pictures, etc. We are committed to keeping our fees the same as last year, but we need volunteers like YOU to make your child’s experience a success! on that night all season. For questions on our recreational program, email .